Who we’ll try and see at the Learning Technologies 2016 event in London, and David Patterson’s preview of the conference. In a time-pressed day it’s impossible to get round all of the many vendors at Learning Technologies, so we thought we could provide a few tracks that you might like to follow as 10-year veterans of this show. Most exciting exhibitor….the one we are looking forward to most…..is…..
Totem Learning is one must visit vendor with the Unlock Leadership product – yes a game which replicates an outward bound experience that’s a yes again as a game….and it is a must must visit at LTs 2016. They’ll be on Stand G3. Totem are the leaders in innovation in serious games and it shows, with a really interesting pipeline of games on the way. Innovation in leadership and management is a serious game, how cool is that. I have a chapter in this book reflecting on the long and overdue journey of gaming and learning arriving in the world of corporate learning and development, so maybe I am a little biased (but only a little). However a robust work proving the efficacy of gaming and learning is long overdue and this is it. Well what are you looking for….if you are on the LMS trail there is plenty choice in 2016. Virtual College are debuting their third generation LMS, and this will be worth a look at Stand E11. We have always been fans of Enable, and our sneak preview indicates this will see one of the most evolved LMS’s on the market. It has a great new UI and lots of added features. A must visit. Netex has been attracting our interest as a platform in recent months and Gameplay is very interesting development from Netex, so it is a must visit stand. There is a lot more to this LMS and its abilities in social learning are considerable as well. Growth Engineering: our friend and colleague Craig Weiss really rates this …and we do tend to agree. Gaming/gamification is quite likely to be very big at LTs this year…..we think it’s exciting so a visit to Growth Engineering is a must. Kallidus is a blue chip LMS we have rated for many years and we are always keen to be appraised of their latest thinking. LearnUpon, well we remember when this company was in its infancy and taking a demo from founder Brendan Noud several years ago and being asked our opinions, we liked it then and a lot of companies like it now, this LMS has really opened up the market in the training industry and gets better and better with its SalesForce integration. Docebo is another must visit LMS vendor. The sheer energy and dynamism of the company is just great and the licensing model means this platform really provides scalability. With a focus on Extended Enterprise this is all about delivering innovation and ambition for company learning value chains. Looop is debuting this year and this is a platform we like a lot. Simple, elegant and very effective as these guys from down under really are tuning into the modern learner. KOKM… we wrote about this platform last year and its progress in the last 12 months has been very impressive and the open architecture of this platform in what it can do is really impressive. Create eLearning is another next generation LMS we like a lot, with a really fresh and clean LMS that has a UI saying “engage with me”. This platform is going to be a winner with learners. Fuse is a social learning platform that we find very interesting and very impressive, so a stand that merits a visit if you are interested in social learning in particular. Moodle and Totara will be at LTs, with Webanywhere on Stand C12, showcasing their continued success with these platforms around the world. Other Moodle and Totara vendors are available of course. I am keen (and pleased) to see D2L with the Brightspace LMS at LTs 2016 (especially after a conversation at OEB). We are always interested in what education brings the corporate world (and D2L chose LTs and not BETT which is noteworthy in itself). Adaptive learning will feature here. I am always interested in LCMS and the doyenne of LCMS.. Xyleme has a major launch this year at LTs, Xy 5. I am really excited to take a look at this platform as it seems to offer some really interesting and exciting new features all around reusable learning content across multiple channels. eXact are the other LCMS vendor I take a keen interest in and appear to evolving, integrating and partnering to great effect. Leo and City and Guilds Kineo will be very good places to start as two of the UK’s biggest and best developers of e-learning materials will be going head to head. We are fans of Gomo the authoring tool that Leo use form many content creation projects. We recently reviewed materials developed in Adapt, the development environment often favoured by Kineo (and others such as Learning Pool) and found amazing richness and elegance of materials optimised for mobile learning. This was a real breakthrough moment as mobile in our experience has been a little flat in several instances. Adapt is for the pro, while Gomo is really giving the Articulate and Adobe duopoly a run for their money which is just great to see, and in our view is Gomo likely to win out as it really makes mobile learning accessible for many organisations. If its game development that you are interested in Totem and Preloaded are both stands to visit. However you would be well advised to take a look at Virtual College and Walkgrove for more bespoke content development services as well. Walkgrove are not well known enough, which is a shame as we reviewed some content they produced recently and we were most impressed. A visit is highly recommended. Virtual College have been developing content for many years and are quite simply very good and very good value as well. Don’t miss this stand. Sponge have emerged as a hugely creative force in recent years…. And we can endorse this by what we have seen and heard…. Take a look. eLearning Studios are also very good content developers and will probably have an oculus rift on the stand as they seek to illustrate the future of learning. CEO and founder Nitin Thakrar is quite a visionary in this world of e-learning and learning technologies. We love his views of the future. We are admirers of WillowDNA who have an exceptionally evolved approach to content development (as well as a neat LMS: Pathway) and are true learning solution partners for companies with real imagination. They’re a socialable bunch and share lots of useful information and insights via their e-learning blog and regular newsletters. Certainly worth talking to at the event. Purple Media always impress us with their development capacity and creativity. e-learning WMB are one really imaginative organisation we like an awful lot, 3d effect content, comedy content and so much more…authoring tool, LMS, bespoke content, off the shelf content… founder and e-learning presenter Emil Reisser-Weston is one of our industries great disrupters. This is a fun stand to visit. 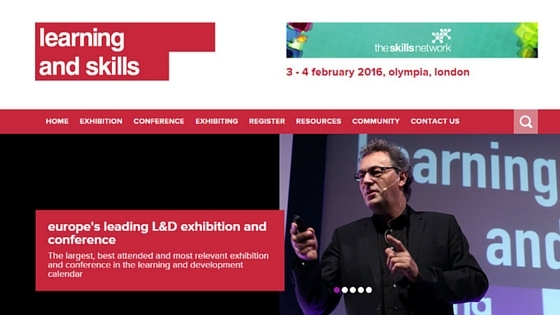 It is noteworthy to see Skillsoft at LTs this year as the content market hots up we see that Lynda (big at BETT as well) and Open sesame are in attendance. We just need Biz Library and the battle for this market can commence in earnest in Europe as well as the USA as players switch around from b2b to b2c and education as well. Degreed are also debuting this year with their approach to learning and content which is well worth investigating. Safety Media are one of the most consistent high-quality producers of materials that make compliance e-learning interesting. Our reviews of their materials always find their health and safety courses to be engaging and effective – and they have a great library of courses. The audit tool is very good indeed. Take a look at Learning Pool (using the excellent Adapt framework for courses) for some good off the shelf materials (as well as evolved development capability and Moodle/Totara), ditto Virtual College with their own solid off the shelf content library and integrated LMS solution. I think we mention these guys too much….but they did win a shed load of awards late last year. If you need to keep up on LRS a visit to HT2 is an essential requirement. Learning Locker is an open source LRS developed by a group of companies led by HT2. Webanywhere are also a Learning Locker Partner doing a lot with the Tin Can API and advocating its growth. Watershed should be the other stop for all things LRS and xAPI, coming all the way from Nashville (the home of the Tin Can project) they provide LRS solutions to many LMS vendors. I am sorry we cannot visit every stand, but we are always keen to know more about your company and your products, so do get in touch if you’d like to meet up for a coffee during the event!